Every once in a while I get emails from readers that just deserve to be shared with all of you. So starting today, I’m going to be sharing your letters as “guest blogs” on Tuesdays, along with my regular guest bloggers’ posts. Here is Shannon’s story. Please share yours with me, too. And if we post it, I’ll send you a signed copy of my book. 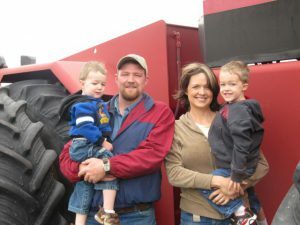 My family and I live in northern Montana, and are organic farmers and members of the Montana Organic Association. I wanted to share a view from a farm girl in Montana, and our struggles with organics. There are very few frustrations as a grain grower—other than the fact that the market hasn’t been there this past year—but we were very blessed by the Lord to have our crops sold when many others had to sit on their crops. The biggest frustrations, though, come from being consumers in the area where we live. We are 75 miles from the nearest Wal-Mart or large grocery store, and even there the choices for organic are so small that very few items I use are even available. An example would be apples; you can’t find organic apples unless you drive 400-plus miles round-trip to a larger city, and then the choice is poor. I have found you can order organic in groceries and produce from Oregon on a truck that comes to our drop-off spot every two months. Needless to say, apples are a scarcity at our home, when they should be something you could easily purchase. I think the hardest part also is the attitude of some people in this area of the country. They feel organic is no different and all recite reports they’ve heard, etc. They argue that food doesn’t make a difference in our health; it’s our genes. They actually consider me to be quite eccentric because I jump through hoops just to buy organic milk. I know of only one other family and one autistic child that consume organic. I’ve had store clerks make comments, from why organic ketchup is a joke to “you’re one of those” because I use recyclable bags. I know people who, if given the choice, won’t buy organic just because. But I am such a firm believer in organics that I stand up for it even if I’m the only one standing. I grow an organic garden, which helps tremendously in getting fresh veggies during the summer. I use to buy all I could organically, and accepted the things I couldn’t get, but now I am even more determined to provide for my family the very best things. It requires all kinds of shopping, ordering online, and stockpiling for several months, along with convincing a grocery shop to special-order. I have two toddler boys, and I can’t accept them having pesticides, etc., in their food when I can do something about it. You shouldn’t have to jump over hurdles to provide the best for your family, and yet corporations dictate most of the choices we are given. I feel empowered as a consumer, but it’ll take more people to demand organics before they will be on the local grocery shelves. It’s nice to know there is a movement out there for something I am so passionate about. One of my dreams is that someday the stores will be overflowing with organic foods and products; chemicals/GMOs will be thing of the past, and my children will live in a better world because of it. Congratulations for being one of “those people” Shannon! Next time someone says that treat it as the biggest complement you’ve ever gotten and thank them generously and sincerely! It may make the speaker stop and think for a second, maybe even put a chink in their closed mind. At worst it will at least make you feel great and make the speaker nervous 🙂 And thank you for growing organic grain! Not much grain grown here in the east, and I am very happy to be able to buy it. Shannon, thank you for being an organic farmer! You are appreciated by many, even if everyone doesn’t “get it.” I second Jean’s advice: be proud to be and buy organic. Know you are doing a good thing for all those that buy your grain, and also for your family. Every bite of organic you can eat is a positive! While it must be disappointing to not have a lot of organic availability in your area, I’m sure your family is benefiting from the environmental benefits of living away from an urban environment: fresh, clean air and all! Thanks for sharing your experience! What an awesome letter, Shannon! I hope finding organic food gets easier for you and your family. I love that you are a proud organic shopper. I’d also like to thank you for farming organically! Shannon you rock! Keep at it. We can only do what we can do in our little corner of the world. I live in Northern California where organics are abundant…yet needing to make a quick trip to the local chain grocery and wanting to pickup some organic veggie of some kind is still a challenge. Yes, you can get organic…from another country. We are still a land of plenty and we can produce enough healthy food to feed all and an at affordable cost. It’s women like you that remain persistent to what they know is best that will turn the tides. ALL SHIPS rise on a rising tide. I am encouraged when I read posts like yours. Thank you. This is a great opportunity for us to read about your challenges in providing for your family-thanks to Maria for sharing. The organic movement is here and growing and I am (as so many are) so grateful. I have been an organic gardener and consumer since 1970 when I had my first baby. I sought out places for organic foods through books and catalogs and OGF magazine and thank goodness we had Walnut Acres in PA, to mail order from. (I think we should get your letter to an organic apple grower). I found an organic apple grower in Front Royal, VA-A.P. Thomson whom I corresponded with and learned much from. We used to go there and buy apples, juice and honey from him-a rare treat in those days. The orchard was alive with bees and butterflies! I wrote an essay about it and won a small scholarship. My dad provided us with garden produce which I made baby food from. There was no organic milk for the most part. Using organic foods was a bit of a stigma back then and noone seemed to care. Factory farms seemed here to stay. You have many on your side now. Shannon! I feel your pain. Since Havre is your closest grocery outlet and they are behind the times. I suggest planting an apple tree. We love ours and it has become a member of the family. Rosaurs has bags of organic apples. Try reading Barbara Kingsolver Animal Vegetable Miracle.. It was good for me to learn how to eat throughout the year. Costco is also doing a great job in the organic department too. Grocery getting may have to become a weekend trip for you all. Your best bet is Medicine Hat Canada…Have you heard of Kalispell Kreamery? THey are producing some AWESOME milk. Will you please send that letter to Jon Tester? http://tester.senate.gov/Contact/ every word counts. You and your boys can come to Somers anytime and pick apples! Thankyou for your letter. The MT Organic movement needs more people like you! Congratulations to another Organic shopper. I am 67 years old & am “always” mistaken for my oldest son’s wife……guess why? When you are around us older Organic Hippies, you see the results! I go for regular checkups & all of my medical contacts are amazed that I am not a diabetic, no high blood pressure, heart condition or high cholesterol. They are all surprised & dispointed. Seems that they don’t consider me the norm! They think it is luck! I put in a full days work…..hard work! When I can’t get organic milk, I drink water. I am considered weird because I will not drink a soda! Thank you for being a medium between us “ORGANICS”, the encouragement & great stories are greatly appreciated & motivational. Good work Shannon! Stick to your guns and plug at it. I am blessed to be living so close to organic products, meats and produce here in Delaware. Although Delaware doesn’t have that many places for organic produce or meats, I am situated so close to PA that I just go there for whatever else that I need. Ditto to PATSY. I also look younger than I am. I remember shopping last year in Trader Joe’s and a man and his wife was asking if I had ever tried a soap sold there and I told them that I have been using that soap since 1984 and a lot of other products, and he said that I look extremely well for my age, not a wrinkle as yet and I am in my 50’s. I also get regular checkups and come away with accolades from my dr’s. Most of my extended family members seem to have high blood pressure, are diabetic or prediabetic, heart condition, etc., all kinds of illnesss, plus obesity. They still don’t get the correlation between eating organic and disease, also using organic products. I wish people would wake up. By the time they do, it will be too late for them and their families. I applaud you Shannon. Keeping doing what is right and best for yourself, family and the environment. You may start something in your area after awhile, then let’s see who’s ridiculed. Thank you Shannon! I hope I get to meet you in Montana next week! As I read your letter I thought you must be from the big flat. My dad was born there and I grew up in Harlem but live in CO. Miss the people but not the winter. Thank you for bringing some awareness of organic to the north country. My family makes fun of me for paying extra for organic but my health has improved so it’s worth the trade. Please pass my regards on to the other Shannon, the schoolteacher. Wow, Shanon. Thank you for writing. Living close to Seattle, we are so spoiled – there are quite a lot of choices in organics, main grocery stores support recyclable bags, there are a lot of sustainable organizations. I live in rural town and attitude towards sustainability is improving all the time. By now, it actually “uncool” to critisize organics. I forget that it’s not like that everywhere. Keep finding people in your area who care, too. The strength is in numbers. We do Green Drinks once a month – kinda a silly for ones who don’t drink but it’s fun and people of similar values can meet and exchange ideas. Whatever works. You are doing awesome. I believe that our family health is helped in a major way by organics. Great Letter Shannon. I am going to post it to FB for the Big Flat to see. Sure do miss it up there!